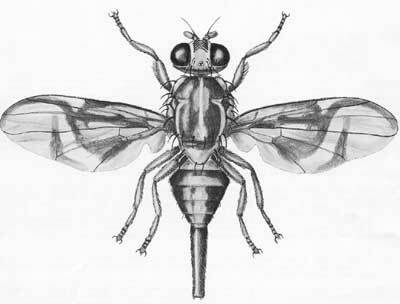 The sapote fruit fly, Anastrepha serpentina (Wiedemann), sometimes called the serpentine fruit fly, is intercepted frequently in United States ports of entry in various hosts from several countries. It is an important pest species in Mexico because its larvae infest sapote, sapodilla, willowleaf lucuma, and related fruits. This species is one of the most widely distributed in the genus Anastrepha. Its range extends from northern Mexico south to Peru and northern Argentina, and is recorded from Trinidad, Tobago and Curaçao. It has also been trapped in southern Texas in the USA, but it is uncertain whether it has breeding populations there (Norrbom 2003). If Anastrepha serpentina were introduced into southern Florida, it could possibly become a serious pest of the tropical fruits grown there. Adult: The adult is a medium sized, dark brown fly, with pale yellow and orange-brown markings. The dorsum of the thorax is dark brown with yellow markings. The wing is 7.25–8.5 mm long. Wing bands are predominantly dark brown, and the costal and S bands are rather broadly coalescent. On the wing, the hyaline areas to each side of the juncture rarely touch the vein R4+5, with no distal arm to V band. The proximal arm is slender and entirely separated from the S band. The dorsum of the abdomen is marked with dark brown, brownish yellow, and orange. Leg color varies from pale yellow to brownish yellow, or brown on one side and pale yellow on the other. The ovipositor sheath of the female is 3.0–3.9 mm long, orange-brown, rather stout basally and depressed apically. The spiracles are about 1.2 mm from its base. The ovipositor itself is 2.8–3.7 mm long, with the tip slightly more than apical half minutely serrate. Larva: The mature larva is relatively large for fruit flies, 9–10 mm long and 1.5 mm in diameter, with the usual elongate shape. Anterior respiratory organs have the external parts somewhat fan-shaped, but nearly flat across the top, with 17 to 19 small, thick, short tubules. For detailed larval characters, see Phillips (1946). Anastrepha serpentina, the type of the genus, is one of a group of four species that differ noticeably in color pattern from other species in the genus. 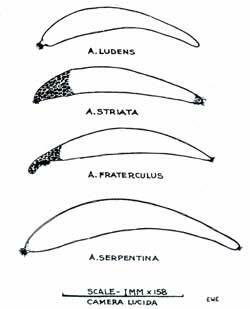 As illustrated by Stone (1942), Anastrepha anomala Stone has the wing pattern as in Anastrepha serpentina, but has a longer ovipositor and a reduced dark pattern on the pleura and abdomen.Anastrepha ornata Aldrich has the costal and V bands separated, and Anastrepha pulchra Stone has a large black spot in the disk of the wing. Females may oviposit up to 600 eggs in about one and a half months. Mature green fruits apparently are preferred. Females have been observed to continue oviposition over periods extending from 21 to 29 weeks under laboratory conditions. Figure 3. Egg of the sapote fruit fly, Anastrepha serpentina, compared with other common Anastrepha species. Drawing by Division of Plant Industry. Also, larvae have been reared experimentally from tomato, Lycopersicum esculentum. Infestations in tree-ripe fruits frequently are so high that in parts of Mexico, especially in Veracruz, growers pick the fruits green and ripen them artificially to avoid infestation. Fruits so ripened, however, are inferior to tree-ripened fruits. Baker AC, Stone WE, Plummer CC, McPhail M. 1944. A review of the Mexican fruitfly and related species. U.S. Department of Agriculture Miscellaneous Publication No. 531, Washington, D.C. 155 pp. Phillips VT. 1946. The biology and identification of trypetid larvae (Diptera: Trypetidae). Memoirs of the American Entomological Society 12, 161 pp. Stone A. 1942. The fruit flies of the genus Anastrepha. U.S. Department of Agriculture Miscellaneous Publication No. 439, Washington, D.C. 112 pp. Authors: H.V. Weems, Jr. (retired), Florida Department of Agriculture and Consumer Services, Division of Plant Industry. Originally published as DPI Entomology Circular 91. Publication Date: April 2001. Latest revision: January 2015. Reviewed April 2018.